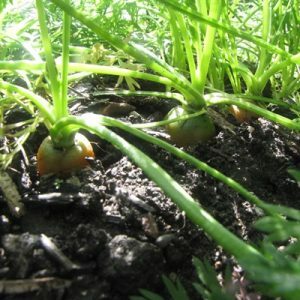 The carrots of our gardening dreams have long, thin, straight roots and taste sweet with a big crunch. It’s just not right to grow them from seedlings. They need to grow from seed in the same spot you’ll harvest them from. Any kink in their roots that occurs during transplanting ends up in kinked roots later in life. You see the tap root which is only the breadth of a hair, does not tolerate transplanting at all. Don’t do it. Your carrots will be a disappointment. Order a pack of organic seeds from green Harvest or Eden seeds. I love Purple Dragon, Little Finger, and Nantes. In the 2-3 days it takes for them to arrive in your letter box, prepare the soil. Some compost, add gypsum if you have heavy soil, worm castings but no fertiliser just yet. Water well, rake to a fine tilth (particle size) and let sit. Now the seeds have arrived, take out 1/3rd of the pack only. 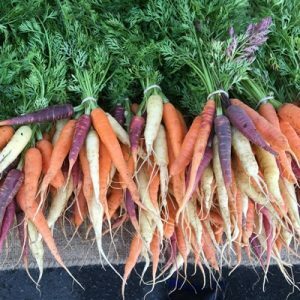 You’ll probably have 50 carrot seeds, thus 50 carrots. Seal the rest in the pack and store it in a cool spot. A linen press is good. 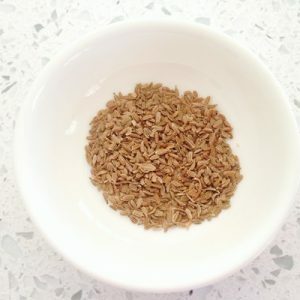 Soak the seeds overnight in tap water or filtered water. The next morning, drain off the water and allow the seeds to dry an hour or so. The sand trick. Next get a cup of sand and tip the seeds in. Mix well. This separates out the seeds so they spread evenly along the rows. Make some rows about 10-15 cm apart and 1cm deep in the prepared soil. Sprinkle the sand and seed mix along the rows. Cover the rows. Firm very gently. Water in well with a gentle spray of seaweed solution. Cover with a piece of hessian, carpet or shadecloth. Water under the cover each day until fine shoots appear, about 7-14 days. Remove the cover now but keep the seedlings moist.AS they grow, water weeklyu with Liggy Max fertiliser (from Linda)or Fish and Kelp. Harvest: They are ready to pull out of the ground when you can see the root starting to appear at the surface of the soil. It soon starts top grow out of the ground, as indicated in the picture below. Its time to pull the carrots up. Grab the hose and water deeply to loosen the soil then grip all of the leaves of one carrot and pull straight up. It should come out cleanly. Now take a picture and congratulate yourself that you’ve grown your own gorgeous carrots! Carrots grow out of the ground a little. They are ready to pull up.